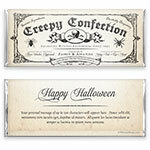 Cast a sweet spell with this wickedly wonderful vintage chocolate bar wrapper design. Design: Apothecary style label with gothic font, skull, spider and fly. Personalization: Various front fields, back title and message.